The Classic Controller is an extension or accessory for the Wii Remote, allowing it to be used on Wii and Wii U. The controller is designed to allow players to play Wii games using a more traditional controller, as well as Virtual Console titles (namely SNES and Nintendo 64 titles) which require more buttons than are on the Wii Remote, as an alternative to using a Nintendo GameCube Controller. 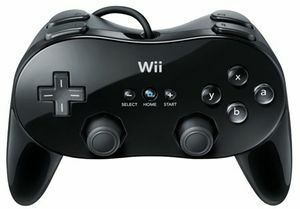 The Classic Controller was succeeded by the Wii U Pro Controller, though Classic Controllers can still be used with Wii U. As of April 2014, the Classic Controller is no longer being manufactured. Rather than connecting directly to the console, the Classic Controller connects to the Wii Remote in a similar manner to the Nunchuk accessory, using the expansion port on the bottom of the remote. The Classic Controller features a similar button layout and form factor to the SNES Controller, though with two analog control sticks on the bottom of the controller, and a pair of additional shoulder buttons, ZL and ZR, positioned directly next to the L and R buttons. The HOME button is also positioned between the Start and Select buttons. The SNES Classic Controller is a variant of the Classic Controller based on the original Super Famicom controller. The controller was released exclusively to Club Nintendo members; in Japan the controller was made available as a reward for Platinum members in 2007, while in Europe and Australia it was released as a regular coin purchase in 2010. The black Classic Controller Pro. On February 26 2009, Nintendo listed a Classic Controller PRO on its Japanese website, which features ZL and ZR buttons as full-fledged shoulder buttons beneath the L and R buttons, as well as added controller grips. The original's analog L and R buttons (similar to a Nintendo GameCube Controller) have also been replaced with digital buttons. The size of the controller is also slightly bigger than its old revision, and has a completely different form factor, more resembling a modern controller with grips. Originally codenamed "Shell", The Classic Controller Pro was released in Japan on August 1, 2009 in both black and white colors. The controller was later released in North America and Europe in November 2009. As with the original model, as of April 2014 the Classic Controller Pro has been discontinued. Alongside the Nintendo Entertainment System: NES Classic Edition, Nintendo also announced the NES Classic Controller, a version of the controller designed after the NES Controller, released with the NES Classic Edition itself in November 2016. All NES Classic Edition consoles are bundled with one controller, while additional controllers can be purchased separately. While it is primarily meant to be used with the NES Classic Edition, the controller can also be used to play NES Virtual Console titles on Wii or Wii U. With the discontinuation of the Nintendo Entertainment System: NES Classic Edition in April 2017, the NES Classic Controller has also ceased production. ↑ 1.0 1.1 Wii Classic Controllers No Longer Being Manufactured By Nintendo. Nintendo Life. (April 9, 2014.) Retrieved June 13, 2015. ↑ Relive past glories with Nintendo's ultimate retro gaming experience. Nintendo (July 14, 2016). Retrieved July 14, 2016. ↑ Nintendo Discontinues the NES Classic Edition. IGN (April 13, 2017). Retrieved April 13, 2017. This page was last edited on 24 September 2017, at 16:44.